We're in the midst of building a deck on our roof, which means I'm in the midst of daydreaming about the final space. We've got a week or two left of construction, so I've been trying to narrow down my choices of furniture and accessories. Of course, like every home renovation project, we've gone a bit over budget (whoops!) so I've been trying to pare down my wishlist. We also don't have much space to store furniture indoors during the winter, so basically anything we buy has to be totally weatherproof (most pieces that are "weather resistant" actually have to come indoors for part of the year if you live somewhere that experiences a true winter). Seriously, those striped loungers? Dyyyyyying. So so cute. If you're totally into stripes, the couch comes in a striped version too. 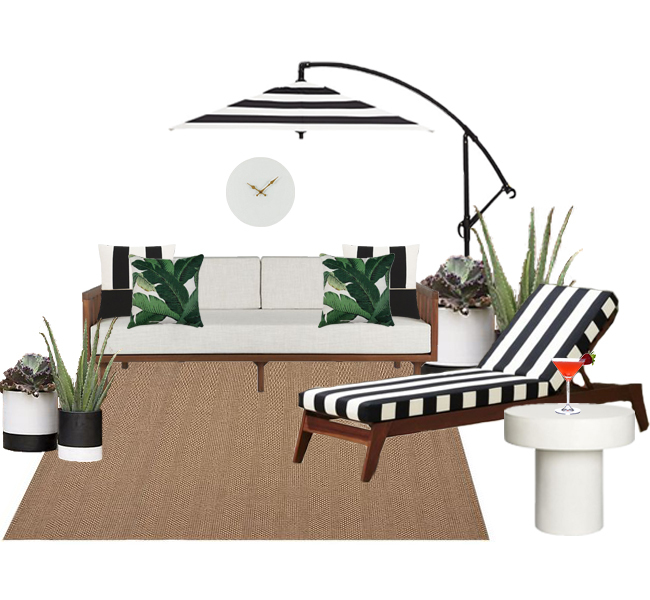 I haven't been able to find anything similar in totally weatherproof materials though, so I think I'll find striped and banana leaf pillows instead to spice up less exciting pieces. Wish me luck!